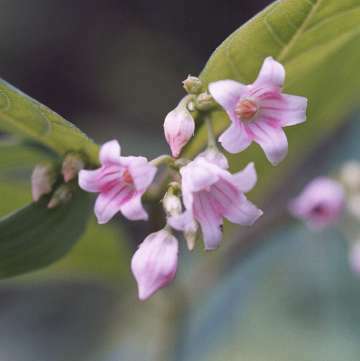 Spreading dogbane’s clusters of small, pink, bell-shaped flowers with candy-cane stripes inside are a treat to see along a woodland edge on a hot summer’s day. The plant itself is toxic. This summer’s hot spells – so different from the cool weather and deluges of last summer – bring visions of ice cream and winter snows. A certain native plant adds to the effect with its clusters of small bell-shaped pink flowers with candy-cane stripes hidden inside, recalling cool delights of another season. The low shrubby plant with flowers that bring us delightful candy-cane stripes in summer has an unglamorous name - spreading dogbane (Apocynum androsaemifolium). The lovely flowers offer sweet nectar, but the plant gets its name from the fact that it is mildly poisonous to mammals, including dogs, cows, and humans. It has an acrid taste, so fortunately it’s not exactly tempting to eat. Another name for it is bitterroot. Spreading dogbane blooms from late June through August. Look for it along roadsides and edges, especially in lightly shaded areas where woods meet fields. The plant has red stems and dark green, oval leaves that grow in pairs, opposite one another. Its flowers look a bit like lily-of-the-valley flowers. The flowers of spreading dogbane attract butterflies. The plant just happens to bloom in the best summer months for butterflies. They come for its nectar. Butterflies can reach deep inside the small bells and sip nectar when they unroll the long feeding tubes that people call butterfly “tongues.” Bees, too, frequent the flowers. These insects pollinate the flowers as they move from one flower to another, feasting on nectar. For smaller insects, dogbane flowers are death traps. When smaller, weaker flies and moths try to poach nectar from the flowers, their short “tongues” often get stuck in the flowers’ V-shaped nectar glands. These insects aren’t large enough or strong enough to pull their tongues away, so they just dangle from the flower and die. For this reason, the plant has earned the names catchfly and flytrap. If you’re looking at dogbane flowers, you might notice a dangling insect that has met this fate. 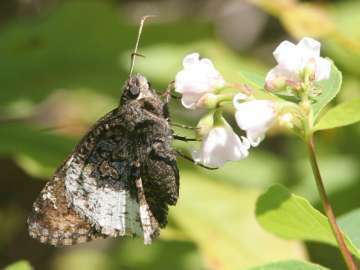 Most butterflies, including this hoary edge skipper, are fond of spreading dogbane flowers and have no trouble sipping the nectar. But smaller, weaker flies and moths can get their “tongues” stuck and die an unfortunate death as they dangle from the flower. Like many native plants, spreading dogbane is used by various insects in ways that don’t involve nectar. Monarch butterflies not only take nectar from the flowers, but they also sometimes lay eggs on the plant. The eggs hatch into monarch caterpillars, which munch the leaves and eventually form their chrysalises on it and transform into butterflies. As with milkweeds, where monarchs most commonly lay their eggs, the poison in the plant doesn’t bother the monarch caterpillars or butterflies. In fact, they store it in their bodies, where it protects them by making them an unpleasant meal for birds. As the monarch’s use of both milkweed and dogbane as host plants for its caterpillars might suggest, spreading dogbane is loosely related to milkweed. And like milkweed, its sap is milky white and contains toxic substances. Both plants also have seed pods containing fluffy fibers with seeds attached. The seed pods form in pairs and open in the fall. Spreading dogbane might be a native plant to consider for the back of a butterfly garden, especially one that borders a wooded area. It’s a perennial that provides nectar to many types of butterflies and serves as a host plant for monarchs. It’s easy to grow from seed. It also spreads readily by its rootstocks, which may be why it’s named “spreading” dogbane. Another insect, the dogbane leaf beetle (Chrysochus auratus), also feeds and lays eggs on the plant’s leaves. Its entire life cycle revolves around dogbane. This beetle is shiny green and copper colored. It looks somewhat like a Japanese beetle – the pesky invasive beetle that gardeners hate – but it’s much more specific in its feeding habits. The dogbane leaf beetle sticks with dogbane leaves and occasionally milkweeds. Its caterpillars feed on dogbane roots. At least five different moth caterpillars feed on dogbane, though not exclusively. Also like many native plants, even poisonous ones, spreading dogbane had medicinal uses in the past. Some Native Americans used it as a laxative and to bring on vomiting, as well as to treat rheumatism and syphilis. Some also used it to treat heart palpitations. Native Americans and early settlers sometimes used the nectar from spreading dogbane flowers as a sweetener. They also found that long, stringy fibers from the stem can serve as cords or laces. If you look for spreading dogbane this summer, you might spot a couple of its similar-looking relatives. Both relatives are toxic. The flowers are white, rather than pink. These flowers are also more tube-like, since their petals do not curve back at the tips. One of these relatives is Indian hemp (Apocynum cannabinum). Spreading dogbane hybridizes with it to produce intermediate dogbane (Apocynum medium). In any case, if you spot the candy-canes striped flowers of spreading dogbane, think of the contradictions – beauty and nectar, poison and deathtraps – all wrapped up in this one interesting native plant.